This one was the first book I've written and illustrated specifically for toddlers or that 2-4 age group. 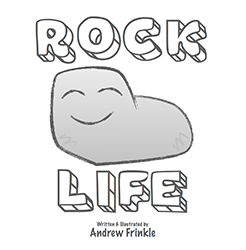 This 8.5 x 8.5 inch full color picture book is about a rock. Stoney is a pretty even-tempered, relaxed guy in any weather and in any situation. Can you handle the Rock Life?